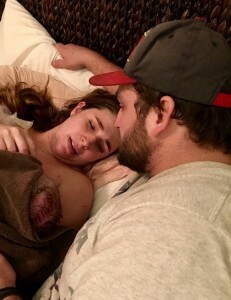 Just wanted to share about a birth I attended last week. Mom’s water released around midnight on the 28th ( about two weeks before her guess date) and waves were very irregular. She had to make a trip to the birth center because she was GBS+. They went home and she called me because they hadn’t finished their Hypnobabies live class yet and didn’t have the birthing tracks. I texted their instructor Anne Deitch Ferguson and luckily she got my message and was able to send them the access codes. I told them to try to rest but she couldn’t get very comfortable and was kind of anxious. Still, things were very inconsistent. Every four hours they had to take a half hour drive in to the birth center for the antibiotics. Finally, that evening after a treatment, the birth center suggested they try to get some rest there as long as no one came in and needed the room. Dad called me about 8:45 and I could hear mom in the background. I joined them about 9:20 at the birth center and mom was moaning and the waves were pretty on top of one another. I gave her a hug and then we used the rebozo through several waves. Moved to the bathroom for a while and then the midwife suggested she get checked at 10:30 so they have a baseline and would recheck around 12:30. At 10:30 she was 3 cm, 90%, -1 station. We moved back to the bathroom and after a little while on the toilet I suggested she take a warm shower and do some hip movements and rocking. She got in and within a couple of minutes she just looked happy. We told stories – she and her husband are high school sweethearts like my hubs and I, talked about the baby, etc. I showed her some movements to do to help open her hips and let her baby engage more. During her waves she looked beautiful, just radiant as she rocked and swayed and said, “Ooooopen” or “Gooooooooddddd” in a low tone as I said verbal hypnosis prompts to her. I had a good feeling things were progressing nicely and guessed she was about 7 cm. The midwife checked her at 12:45 and she was 7 cm, 100% and +1. I was thrilled! The midwife left the room and I saw her body do a short involuntary push. I ran to the midwife and asked if I could start filling the tub and told her what I saw. She told me it was fine to fill the tub and that she shouldn’t push yet. I went back into the room and had mom get up. She wrapped herself around me and we slow danced through the waves. Her body was definitely pushing and I tried to help her take the pressure off her body. I traded with her husband after a while and then we got her in the tub. She pushed once and the head came out. The midwife had her get out of the tub on to her hands and knees (it happened so fast I’m still not quite sure what alarmed the midwife). She bore down and after maybe five pushes out came her little guy – calm and covered in vernix. He was born about 1:10. From 3 cm to babe in her arms in less than three hours!!! It was amazing! Mom was so calm and in control.